Finding the perfect wagon that satisfies my loading and moving needs has been a struggle. I have purchased other carts that claim to be the best ones. However, they did not seem to stay with me through thick and thin, since they just gave up so easily when I passed it through minor rocky pavements. Since that experience, I worked hard on looking for the best wagon that won’t let me down, and fortunately, I found the one I have been looking for with my Creative Outdoor Wagon. This Wagon is the best-performing wagon I’ve ever had! It is reliable to use in any kinds of terrain; snowy, sandy, rocky or plain. Furthermore, this wagon is very easy to store with its foldable structure! 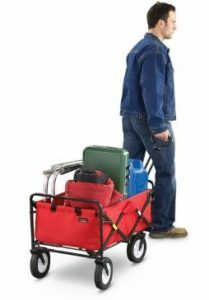 Are you in search for the perfect wagon that is reliable multi-functional? Check out this creative outdoor wagon review. It is made with durability and toughness. It can be used for any purposes and in any kinds of terrain. It has extra storages other than the wagon’s primary storage. It is foldable and easy to store. Its wheels have the ability to swivel for easy maneuvering. It does not need to be assembled. It can be use as beach trip, tailgating, gardening & picnics etc. The handle bolts tend to be loose. The basket is not removable. This wagon should not be exposed too much on the outdoors because it is not resistant to rust. This wagon can be used on any terrain kinds, but it might be a little bit difficult to roll through sandy terrains. Creative Outdoor cart has a solid frame made of steel and a powder-coated frame finish that assures you it is durable, heavy-duty, great-looking and resistant to minor weathering. In addition, this strongly-built wagon is reliable to use and can endure heavy loads even if its capacity is maximized. Thus, with this cart, you can do more and carry more loads even up to the maximum capacity without worries. Creative outdoor wagon with canopy has an optimum capacity and capability you can never find in other wagons. 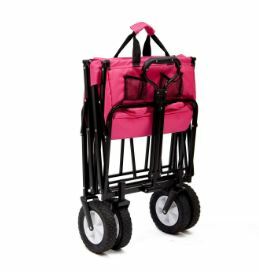 It can endure the heaviest load up to 150 lbs with its strong Polyester fabric support and steel-made frame. 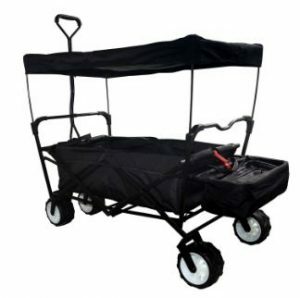 Creative Outdoor Distributor wagon also has a canopy top that shades your objects and equipment inside it and protects it from the harmful rays of the sun. You won’t have to hesitate to use this garden cart even on outdoors. Aside from its primary storage, Creative sports wagon also has 09 pockets and a basket. There are 03 pockets in the front, 06 pockets on the flap and a basket on the back side. Thus, there is plenty of room to store your small objects in the pockets, and you can use the basket to store bigger objects. 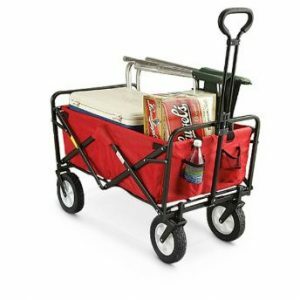 In addition, this wagon’s basket has an insulated cooler where you can place your beverages or snacks. Creative Outdoor wagon’s wheels are the first edge of this product. It is extra wide and rubber-made, making it great to roll in any kinds of terrain; snowy, rocky, sandy or plain. Besides, this wagon’s wheels are smooth to move and do not vibrate too much. This collapsible wagon with canopy also has front wheels that can rotate 360 degrees, and smooth-rolling rear wheels which enable you to maneuver the wagon with ease and manageability. This wagon has a long and tough cushioned grip handle which allows you to maneuver the wagon with ease. It’s handle is also made strong enough for you to move the wagon manageable without worrying whether it might break or will not support the cart’s weight well. It is helpful that its handle is extra-long and cushioned to provide you comfort while rolling it no matter what the terrain is. 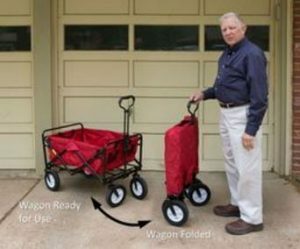 Creative Outdoor Distributor collapsible wagon is easy to store because of its ability to be folded. This is a collapsible wagon that stands up without wall or any support, even if it is in a folded position. Besides, it can easily fit into any small spaces. Thus, it can fit in car trunks and cabinets, or you can just place it in any available spaces in the house. What makes this cart the best one in the market is it is not necessary to assemble this product. Unlike other garden carts requiring much time and effort in assembling, this wagon totally frees you from that requirement. It is not just durable and perfect to use in any kinds of terrain; it also allows you to save time and do more important things than assembling it. By using this wagon, you can use it for any purpose, especially for outdoor events such as beach outings, tailgating, and picnics. This garden cart can be used for household loading and moving purposes. It can also be used when you are doing yard work or maintaining your lawn or gardening, and you need to transfer objects, basic gardening tools and equipment from one place to another. You can use this wagon for any event, occasion or situation; indoors or outdoors. You can buy it with canopy or without canopy. More than 10 different colors are available with this wagon. Each color/model has its own features. Creative Outdoor wagon does not need to be assembled. However, it would be best if you tighten the bolts and check if the parts are connected well and tight, for you to use it with ease and without worries. Household owners who maintain their lawns and gardens. 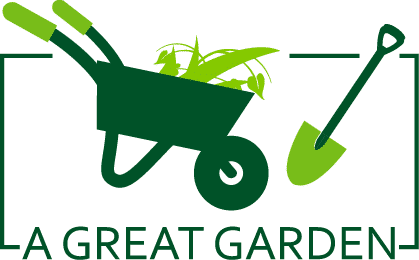 Household owners looking for a garden wagon perfect to use even for indoor gardening purposes. Families who are fond of doing outdoor activities. Anyone looking for a reliable wagon that is fit to use for any purpose. Q: Are the fabric parts of this Creative Outdoor wagon removable? A: The canopy top is removable and can be easily washed. However, the fabric support and the basket are not removable. Nevertheless, you can still find ways to clean the other non-removable fabric parts of this wagon like brushing it or cleaning it with a damp cloth. Q: Do this wagon’s tires leave marks on the pathway? A: Even though this wagon’s tires are made of rubber, it does not leave marks on the path. Q: Can the wheels of this wagon roll through rocky roads? A: Yes, it can run through rocky roads and any kinds of terrain, which makes this wagon very ideal to use on outdoors. With the benefits and multi-purpose features this product has, no wonder it is one of the best wagons perfect to use especially on outdoors. Its structure is made of steel which makes the whole cart sturdy and durable. It also has a lot of pockets and a basket which you can use to store other minor things, making the main storage exclusive for larger and heavier things that weigh as much as 150 lbs. Besides, this wagon’s wheels are toughly made, and can swivel and smoothly roll through any kinds of terrain. Though this Creative Outdoor wagon has minor drawbacks like the rust-susceptible frame, loose bolts, and non-removable basket, the benefits it can provide you greatly outweighs these disadvantages. Plus, it is available in colors blue, camo and pink; you can pick what color you like! Finally, if you are looking for the best outdoor wagon to satisfy your loading and moving needs especially on outdoors, I highly recommend to buy Creative outdoor wagon – any time any day.